For Day 97 the detail I am featuring is another example of using rick rack in crazy quilting. The rick rack has been attached with Zig Zag Chain using DMC pearl #5 thread. I have stitched three straight stitches between the V’s of the braid, then topped with seed beads. 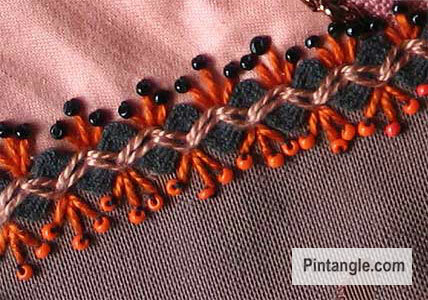 This is a simple quick seam embellishment that I often use when ever I get stuck for an idea! 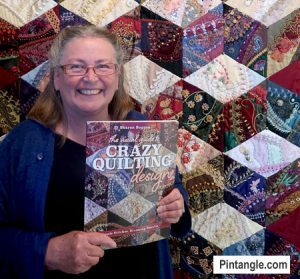 If you are just swinging by, or a search engine has landed you here, this is day 97 in a series of articles that aim to give you embellishment ideas that you can use in your crazy quilting. If you want to print out this series 100 details for 100 days, they are listed under that category. Have you enjoyed this series? If so you may be interested in a tutorial I have written on how to work decorative crazy quilt seams. The tutorial is a comprehensive tutorial that I converted to a pdf file (a link to the download is in the article) When I converted it I realised how comprehensive it was. At 19 pages of information it is a resource worth investigating! I love the use of rickrack in the seams. This looks easy enough that even a beginner like me might be able to do it..thank you so much for all you do for us. Sharon, I don’t know if you’ve been asked this before… but… just out of curiousity… do you think you’ve tapped your creativity for the time being for CQ details or do you think you could keep going… if you chose to? I love all you’ve done and appreciate the inspiration SO very much. I printed out each picture 9 on a page, I think, and each seam detail and pasted them in a little binder of index cards to use for inspiration as I’m stitching. I took it to my embellishment bee the other night and it’s got others perusing your site. The top card gives you credit and your website, so I’ll be showing it to anyone who is interested!